The Arms now in use by the Company were granted in 1486, but fell into disuse in about 1530, when different Arms were used. In July 1972 the Court decided to revert to the original 1486 Arms. The Arms displayed in the Hall and on the doorway are those in use from 1530 to 1972 and are as shown in a manuscript of the College of Arms compiled about the year 1530. The escutcheons have no symbolic reference to the Stainers trade, but are to be found in the Arms of fraternities of shield painters on the Continent of Europe. It is likely therefore that their introduction signified the Painters' claim to pursue the craft of Arms painting independently of the College of Arms. Azure a chevron between three phoenix heads erased or beaked gules. Crest: On a wreath or gules a phoenix proper. Supporters: On either side a panther argent spotted with various colours, ducally crowned, collared and chained or. The ffeld Asure, a chevron betwene thre ffenyx hedes rased gold membred Goules, the creste upon an helme, a ffenyx in his (Pro)ppre nature and coloures set with a wrethe golde and goules, the mantell Asure, furred with Ermyne. 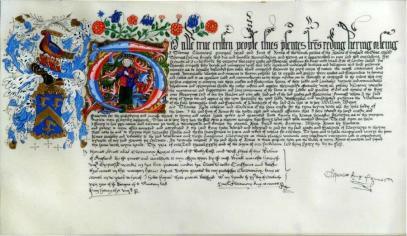 The original Grant is now largely illegible but during 1969 a replica on vellum was scribed and painted by Mr John Ward, a Liveryman, to preserve the wording. This now hangs in the Court Room. The right to bear and use Arms in the case of a corporate body, cannot be got other than by grant of a King of Arms acting in the exercise of his authority which he has from the Crown. The earliest known grant to a corporate body on its receiving a Royal Charter of incorporation is that to the Drapers Company of London in 1439. Thereafter up to the year 1500 some twenty-four Patent of Arms were issued to Livery Companies of London, among them that of the Painters Company in 1486. The granting Kings of Arms was Sir Thomas Holme, Clarenceux King of Arms. Before I turn to the Arms and Crest which he granted and which are the main subject of my address today, let me tell you something of the man himself, a King of Arms to whom indeed this Company owes much, he having composed and originated the Painters’ insignia, the heraldic devices by which the Company is known and of which all its members are rightly proud. First of all, while the year of his birth is not known it can be calculated that Holme was born about 1430. He was a busy and diligent Herald: Falcon Pursuivant in Henry VI’s reign, Rouge Croix Pursuivant of Arms in 1457, then Windsor Herald of Arms in 1461 and Norroy King of Arms in 1464, then Clarenceux King of Arms from 1476 until his death in 1493. By his Will he desired to be buried in the Holme Chapel in St. Paul’s Cathedral (and so it may be inferred he still lies close to Painters’ Hall). He was much engaged as a Diplomat, for example he was one of the embassy in 1480 to treat with Christian I, King of Denmark, to arrange an alliance, and about this time was knighted. His Motto, excellent for a Diplomat, Herald and a Painter Stainer like, was SOBREMENT, SOBREMENT “Soberly, Soberly”. I have said he was a busy and diligent Herald - he issued Patents of Armorial Bearings to no less than ten Livery Companies of London, more than any other King of Arms during the 15th century. The Painters Patent of course was one of these and it is remarkable that of these ten Patents (they include those of the Cutlers, Merchant Taylors, Bowyers and Blacksmiths) there were six wherein the Arms granted as in the Painters own case had a chevron in the Shield. Let me blazon the Arms he granted in Thomas Holme’s own words (which happily are in English rather than law-French or Latin):“The Field Azure a Chevron between three Fenyx Heads rased Gold membered Gules the Crest upon a Helme a Fenyx in his proper nature and colour set with a Wreath Gold and Gules the Mantell Azure furred With Ermine”. Azure - The Shield is blue, the colour of the sky, of the heavens, coming from the Arabic “lazura”, Persian “lazurd”, Italian “azurro” and in French “azur”; combined with gold for the chevron and phoenix heads, the effect is rich indeed and suitably inspiring to a Painter in the exercise of his art: blue being the colour, which according to the old writers “sheweth the bearer to be of goodly disposition and in renowne to the end of the world”. Phoenix Heads - The chevron divides the shield nicely into three portions, into which the phoenix heads neatly go. The chevron appears more often than the cross in heraldry, having this useful characteristic of partitioning the somewhat awkward shape of a Shield so as to make it tractable and the better to accommodate the emblems with which it is combined. The phoenix, a mythical creature, consecrated to the sun, is much rarer than the chevron but with the latter, three phoenix heads make a unique and lovely composition. Clarenceux Holme knew what he was doing. Why the phoenix heads however‘? The simple reason is that legendarily this mystic bird is ablaze with colour, hence suitable for Painters, apart from its religious signiﬁcance, as typifying the Resurrection and symbolizing heavenly and earthly love. 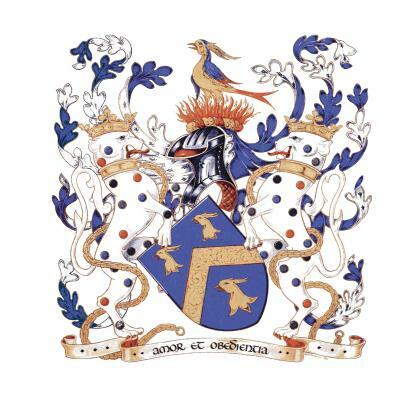 The theme of the Company’s Motto ties in nicely with this, and the Arms and Crest as a whole are a good example of the religious allusions which is a feature of 15th century Livery Company Heraldry. Certainly the Company’s Armorial Bearings would be of appeal to the 15th century Painter and give him heavenly and artistic inspiration in his activities within and without his fraternity. I will not dwell on the alegorical and moral qualities in the story of the phoenix - so much has been written thereon already: but just let me use Thomas Holme’s own words (from another, not the Painters’ Company patent of arms) again, in describing the proclivity that has made, from ancient times, the phoenix so well known and a bird of such an intriguing nature. Ashes, out of which there ariseth another”.Is not such a quality of renewal a great spur to human endeavour? Of the capacity of art to transcend mortal things? With these attractive and signiﬁcantly symbolical Arms and Crest, the invention of Sir Thomas Holme, the Painters might well have rested content - but there is some evidence that the Company did not. In the1530s it appears that the Painter Stainers had begun to use a quarterly Coat i.e.added to the chevron and phoenix heads which were relegated to the second and third quarters of a quarterly Shield, another Coat of Arms, in the ﬁrst and fourth quarters, viz. Azure three Escutcheons two and one Argent. Sir Thomas Holme, and in no way did he, Benolt, alter Holme’s grant (as can be seen on looking at the 1486 grant itself, in Painters; Hall). So by 1520, officially speaking, the Company was still in enjoyment of its 1486 granted Arms; but unofficially had assumed as well, Arms of Azure three Escutcheons Argent. The answer is not, as has been asserted on occasion, that the Painters, having become united with the Stainers, another ancient Guild, in 1592, combined the Stainers’ Arms with their own. The Stainers did not have any Arms of their own, which fact of course is complete refutation of the above theory. What the Painter Stainers as a Company were doing in marshalling two Coats of Arms in one Shield, quarterly, was a conscious reversion to the Arms they had used before Thomas Holme’s Grant of the phoenix heads in 1486 while at the same time retaining the latter as their granted Arms. This fact, as I now state it, has never been asserted as an explanation of the quarterly Arms of the Company, until now. The reasons lying behind the Company’s action will be realized when it is understood that the Painters as a craft guild, not only in England but in Europe, counted among their skills the making and painting of Shields for tournaments, pageants and battle: they were shieldworkers anciently, latterly being more engaged in painting Shields of Arms on wood or stone or murally and monumentally for decorative and commemorative purposes than in actually working and making a Shield upon which they then rendered its owner’s Arms. The European guilds of Shieldworkers had their own insignia as such---in Germany they used a red Shield painted with three silver escutcheons, as the sign of their craft. In France, the Shieldworkers displayed a blue Shield with three silver, generally golden, Shields on it; in the Low Countries blue again was the colour sign of the Shieldworkers and Painters, with silver inescutcheons, and there being close links between the Netherlands and England in the 14th and 15th centuries in such crafts and skills, it cannot be doubted that the Shield painters of London, the present Company’s predecessors, being part of a fraternity that transcended a country’s boundaries, regarded themselves as best proclaimed by a Coat of Arms, Azure three Escutcheons Argent, like their Dutch contemporaries. These Arms must have been theirs before 1486, being used to show what in fact the Painters did, make, as well as paint, heraldic insignia on Shields. No doubt the particular rationale that lay behind this combination of new Arms as granted in 1486 with the older craft tokens of the three silver Shields on blue was that, proud though the Painter Stainers must have been of their new Coat of phoenix heads with its allegorical imagery, its fancifulness even, they wished also to show that they were practical craftsmen who had a long history in the actual making of Shields of Arms. The adoption of the additional quartering in the Painters Arms was not therefore as it has been represented an act done in deﬁance of the Heralds, with whom in truth, the Company’s quarrel was much later to develop, this stemming however in all probability from the actions by Thomas Benolt, Clarenceux King of Arms, who in 1530 by his deputy visited many City churches, as well as St. Paul’s Cathedral, and caused to be taken down and carried away many Shields of Arms from tombs and monuments on the grounds of their lack of authenticity or accuracy, many of these of course having been made, constructed and painted by the Painters Company. If some of the Shields taken down on Benolt’s authority (he had a commission from the King “to corecte deface and take away all manner of Armes wrongfully borne or being falce Armory”) had been produced by the Painters and set up without reference to the Heralds, this rather later in the century leading to the quarrels between them mainly concerning the organization of ceremonial funerals and the display thereat at the Arms of the deceased, the Heralds never objected to the resumption by the Painters of their early traditional “craft” Coat, nor to the quartering of what I have called the old and new Arms, and even recognized this arrangement specifically by entering the combined Arms in their records at the Visitation of London made in 1634. The Heralds never attacked what the Painter Stainers Company was doing or had done in respect of its own Arms, the traditional and the granted Shields of the Company. At this time the Company Supporters, the panthers or “panters”, a neat play upon the name of the Company, were recognized as justly borne and used by the Company and I do not think I need take the story any further than this, because everyone here knows what has happened since then - the Arms, Crest and Supporters of the Painters, otherwise Painter Stainers Company have been borne and used by the Company in a number of artistic variations until this day and are now being borne and used as regards the Arms as Clarenceux Holme granted them in 1486, the splendid Coat simpliciter of the golden chevron between three golden phoenix heads. Nevertheless, it would not be wrong or in any way contrary to the usages of heraldry for the Company to bear also if it wished the joint Arms, the old and the new Coats, this indeed having a certain advantage in that it reﬂects an ancient but perhaps lost sight of skill of the Painters, the making as well as painting of actual Shields of Arms.